Kangaroos are legal tender .9999 fine 1-oz silver coins minted by the Royal Australian Mint. They come 25 coins to a tube, ten tubes to a box of 250. This packaging makes them unique among government-issued 1-oz silver rounds. U.S. Mint Silver Eagles and Royal Canadian Mint Silver Maple Leafs come in boxes of 500 coins. Silver Eagle boxes contain twenty-five tubes, each tube holding 20 coins. Silver Maple Leaf boxes contain 20 tubes, each tube housing 25 coins. Boxes of Silver Kangaroos weigh 21 pounds each, whereas boxes of Silver Eagles and Silver Maple Leafs weigh 41 pounds each. Silver Kangaroos carry a “legal tender” face value of $5 Australian, Silver Eagles $1 US, and RCM Silver Maples Leafs $5 Canadian. The “legal tender” face value is meaningless as the coins are sold for the value of their silver content, which is much higher than the legal tender value. Government-issued one-ounce silver coins are extremely popular, with the American Silver Eagles being the most sought after, more than 500,000,000 minted. However, the 250 coins to a box are causing Kangaroos to grow in popularity. Much easier to handle. The Kangaroo image, which is on the reverse of the coin, changes annually. As for Silver Eagles and Silver Maple Leafs, the only thing that changes is the date. Some dealers assert that because of the annual image change Kangaroos could pick up premiums as time passes. We think that is a remote possibility and that the Kangaroos should be bought for their convenience and beauty. No government-issued coins are more beautiful than the 1-oz Silver Kangaroos. If you like to know more about buying Australian 1-oz Silver Kangaroos, call us at 800-528-1380. 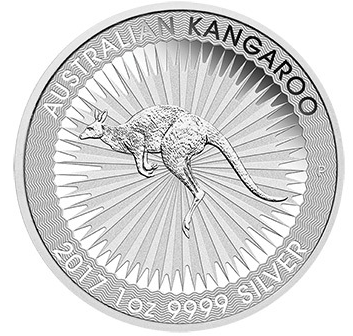 For a quick check of the Kangaroo price, and other silver products, visit our Silver Bullion Product Prices page.